How much texture do you need? I have written much recently about the importance textures have for me in paintings. In fact, when I begun to move away from pastels to paint, I was keen on working with oils precisely for their ability to layer heavily and thickly. In fact, one of the first purchases for my acrylics (which were the paint I started with, rather than oils) was heavy impasto medium. In any case, talking about textures also made me realise that it's more subtle than 'a lot of texture'. 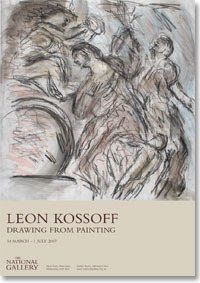 In fact, with may heavy layering and impasto I often find I lose the interest in some paintings - e.g., while I admired Leon Kossoff's drawings at the National Gallery, I was rather quickly moving away from some of his oil paintings. 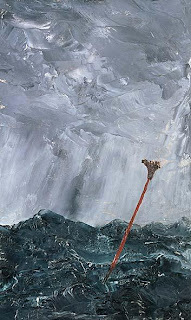 Similarly, Strindberg's abstract and evocative land- and seascapes are heavily textured but... hm... I dunno... I haven't quite figured out what it is about texture/too much texture, but my first hunch is a question of opaqueness and how much light is coming through the painting. 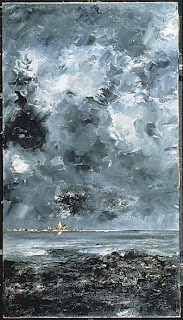 Strindberg's waves and clouds are very dark and brooding, at the same time he seems to work liberally with white to lighten his darks, yet it seems flat and opaque. Does the light of the canvas balance texture? 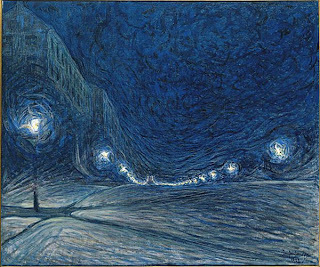 The second Swedish painter I discovered is Eugene Jansson - also painting from around the late 19c, Jansson produced a whole series of evocative, enticing and melancholic cityscapes and landscapes. Many of them in various shades of blue, they are at the same time full of light and lightness. This one here just made my new desktop background: those icey blues just sing even in their 72dpi flatness. Thank you, J.! Such good suggestions! A BBC4 documentary on the Genius of Photography was repeated tonight. 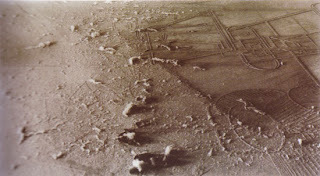 It's second part examined the impact of experimental photography as art - notably for surrealism and dadaism. 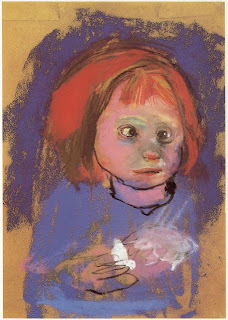 Intrigued by the experimentation with subject - e.g. extreme close-up and the taken-out-of-context - as well as chemicals, I had a look for some of the images and techniques used. 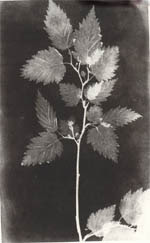 - Fox Talbot's sun pictures of the 1830s where he created light sensitive paper on which he could 'draw' by placing objects on top of the paper and then exposing it to the sun. 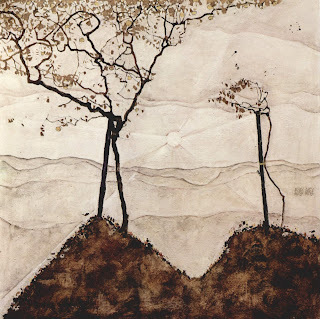 - August Strindberg's celestographs, exposing photographic plates to the night sky to capture the cosmos. Here's a great article by Ben Lifson, a US-based photography teacher, on working with abstraction to composition. Well illustrated and written, it examines different genres and approaches to explore the potential for abstraction while looking at the composition of various artworks. 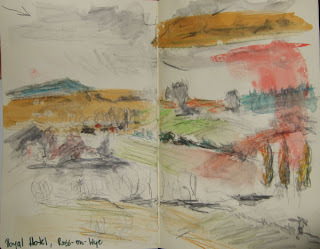 Beginning with landscapes by Constable and Corot, the article then moves on to abstract photography. It is well worth a read and the illustrations are very useful. ... to accompany the tree talk... here are some of my own photos on the subject. One of the name that came in my art group yesterday was the Scottish painter James Paterson (1854-1932). 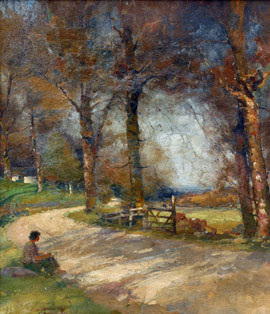 Loosely associated with the Glasgow Boys, Paterson along with contemporaries such as James Guthrie and John Lavery, influenced Scottish art in the 1880s and 1890s and challenged the dominance of Edinburgh and the Royal College of Art (good old city rivalry in practice) - many of them to become later in their career established society painters. In any case: Paterson painted primarily landscapes around the village of Moniaive in Dumfrieshire where he had moved to in the mid 1880s. 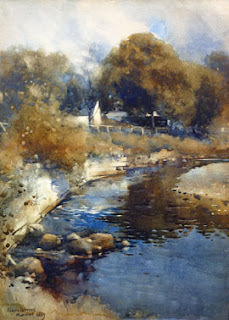 His paintings in oil and watercolours were often done en plein air - in the spirit of the Glasgow School. 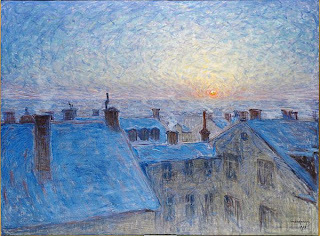 I think I found the painting Tom recommended to me yesterday, but it's a fairly poor reproduction. However, the painting is displayed at the Kelvingrove Gallery, so I will pop along to have a better look at it. Tom admired Paterson's ability to paint the trees very lightly, and transparent while giving them solidity nonetheless. Paterson was also a keen photographer - capturing many of his scenes on film. This publication in honour of his 150th birthday in 2004 provides some very good examples of how photography and painting complemented each other in his works. Whether trees in my paintings turn out ok or not is still largely determined by coincidence. I remember well how I - with my set of Unison landscape colours (15 greens!) - tried first to paint trees from life, and gloriously failed: it just ended up like a mess of colour - same colours, too little highlights and shadows, and no structure. Having moved on a bit from that, it's painting loosely and sparsely with anything but green that seems to work well; also: if trees are in midground to background, that makes it easier, too. Yet, I figure it's time to have another go at more training on trees. There is some greenery I want to put in my desert landscapes and currently it's not working: I know how to fix it by cropping and cutting it out, but that is a bit like cheating. 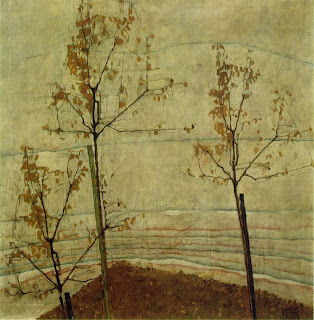 So, when my art calendar presented my with a previously unknown painting by Egon Schiele, I took it as a gentle push to look at his work again. 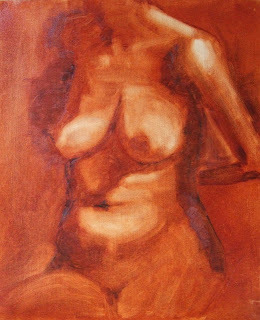 I have been admiring his life studies for a long time, there is something haunting, unsettling and beautiful in his nudes: arms, legs and torsos in odd proportions, all looking out at the viewer and making it almost impossible to avert ones gaze. 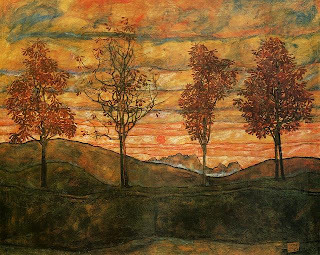 As a start, here is a first little gallery of some of his trees - most of them are autumn trees - a few coloured leaves, a few left over fruits and above all those trunks and branches, reaching above into the sky, almost in mourning - again: simple lines, muted colours draw me in, don't want to let me go and almost give me goosebumps while keeping looking and looking and looking. I've been a bit preoccupied with my decision to paint my living room last Sunday - and a week of evenings spent painting white walls (and discovering far too many missed spots here and there) took over from other painting. 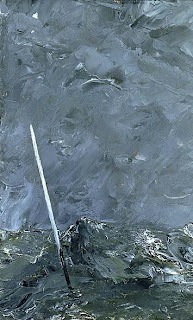 Yet, one thing that keeps in my mind is how flat photos of paintings tend to look and that the excitement of actually making paintings is for me very much in the textures and layering.